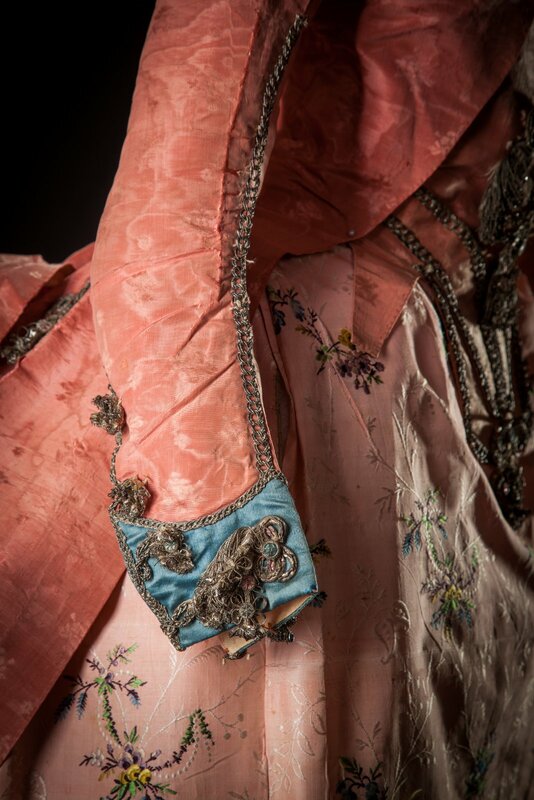 an embroidered robe à l’anglaise out of cotton voile with no lining at all, based on this dress in the Met. The second half was spend on an embroidery project which still isn’t finished. And it’s not because I didn’t try to finish it. It’s just a bit too much. 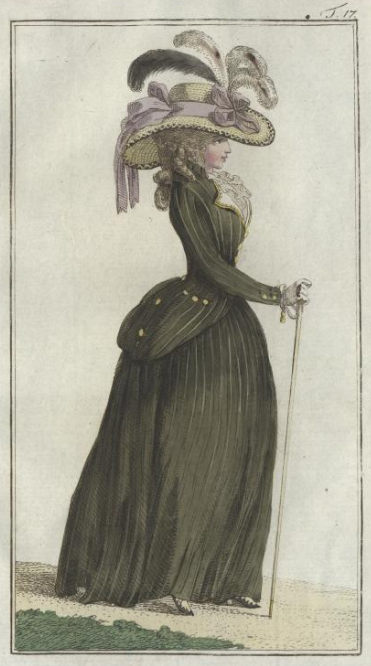 In late 18th century French fashion magazines a word turns up that just like the English “handkerchief” of the same time period is fundamentally confusing to modern readers: the “corset”. I love 18th century embroidered waistcoats. Whenever I see one – be it in a museum, an auction catalogue, or on an reenactor – I want them all. Or at least one. Now this is a kind of men’s item and I am not a man. And I am short and have a chest and hips which is a pretty antithetical to the fashionable men’s silhouette of any time period. 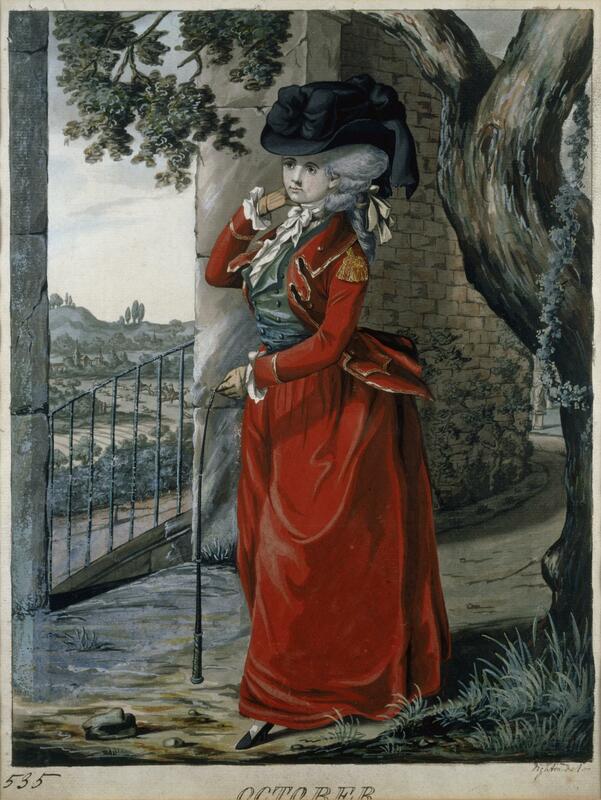 And in the 1780s there wasn’t just a trend for riding habits that looked like military uniforms. But also one for big buttons, lapels, collars and the visible vests/waistcoats that looked like menswear in general. Obviously the next step of that fashion wouldn’t be just wearing plain waistcoats but embroidered waistcoats. And there are indeed three extant examples that can be kind of dated into the 1780s. One in the Decorative Arts museum in Lyon, France, two others in the V&A in London. The one in Lyon is multi-colored and goes over the hips. 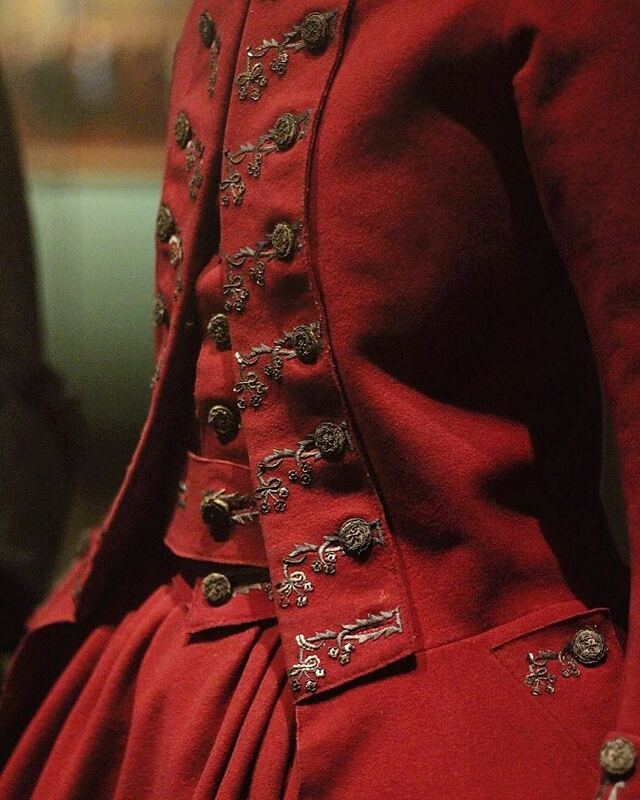 But the whole ensemble contains a jacket that has been clearly altered with a very non-18th century dart. Obviously this is noted in the museum’s description, however it is worded without making a distinction between jacket and vest. So it is possible that the waistcoat itself is subject to a 19th century alteration. The worst case would be that it is a men’s waistcoat, altered for women’s wear. It doesn’t seem like it to me though. 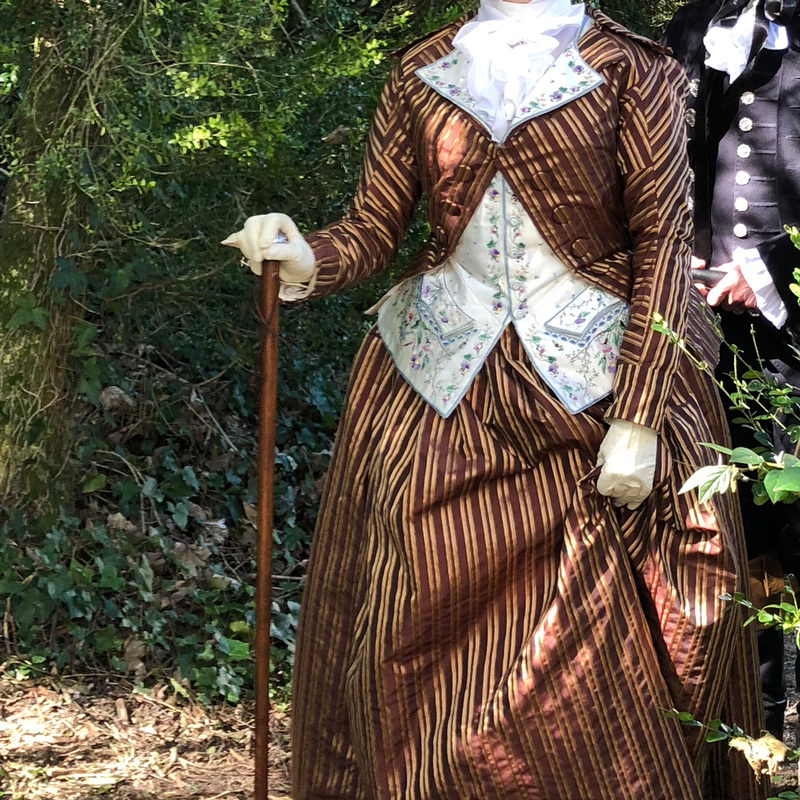 It’s clearly not professional embroidery work (the chain stitch is way too irregular for that) and the whole pattern is very unlike a men’s waistcoat (especially the button/buttonhole placement and the overal shape of the garment). The waistcoat in the V&A shown on the left doesn’t have hip flaps and it’s monochrome. And even though the shape says 1780s, the museum insists it’s 1790 on the dot. I call shenanigans. 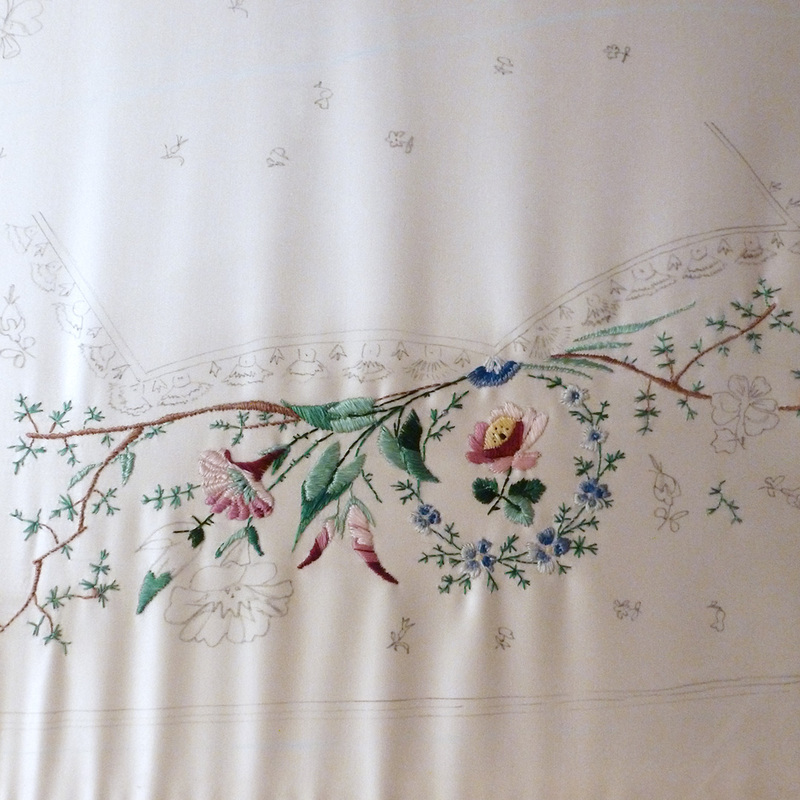 The one on the right is embroidered with gold and blue floral vines and also dated to around 1790. Finally, there is also a mention of an gold-embroidered “manns-gillet” (men’s vest) in the June 1787 edition of “Journal des Luxus und der Moden”. 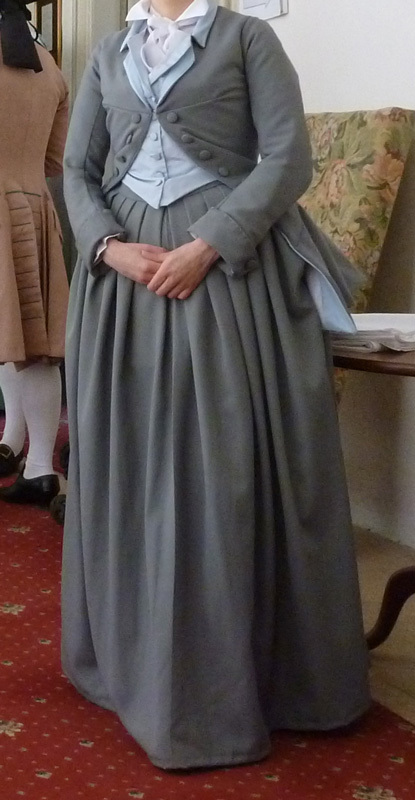 Arguably, this is not the greatest proof that my waistcoat would have made this way for a lady. But it’s enough to rationalize it as possible. 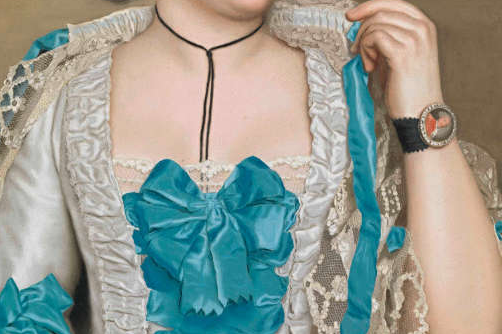 Having found the excuse to do a waistcoat for me, I started to look at the embroidery on a lot of 18th century waistcoats in close-up detail. The usual look of men’s waistcoats is characterized by extremely even, generous and clean stitching, implying seasoned professionals at work. The embroidery is also very decisive and once the embroiderer decided that rose leaf #4 is to be stitched from southeast to northwest, then all other rose leaves#4 on that side of the waistcoat will also be stitched from southeast to northwest. And while that sounds pedantic, it’s effective. 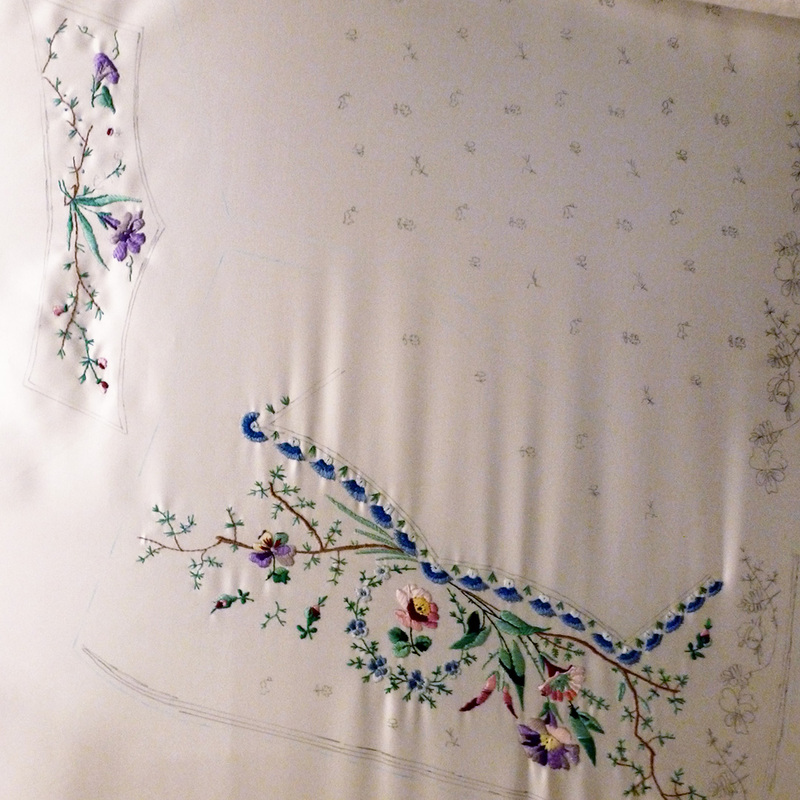 In the process of making the waistcoat work for my sewing pattern I stretched and bend my embroidery pattern for the flower border a bit. 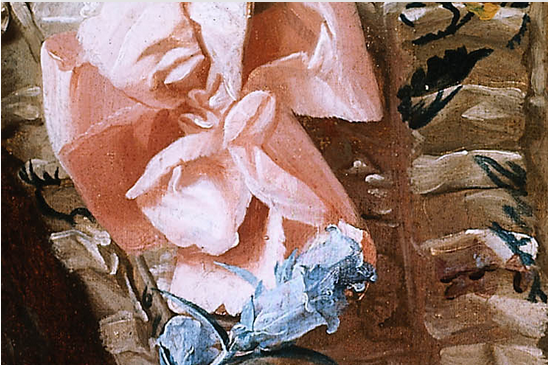 These flowers were not that even, not even on paper. But stitched in the same direction, they look actually more alike than they did on paper. 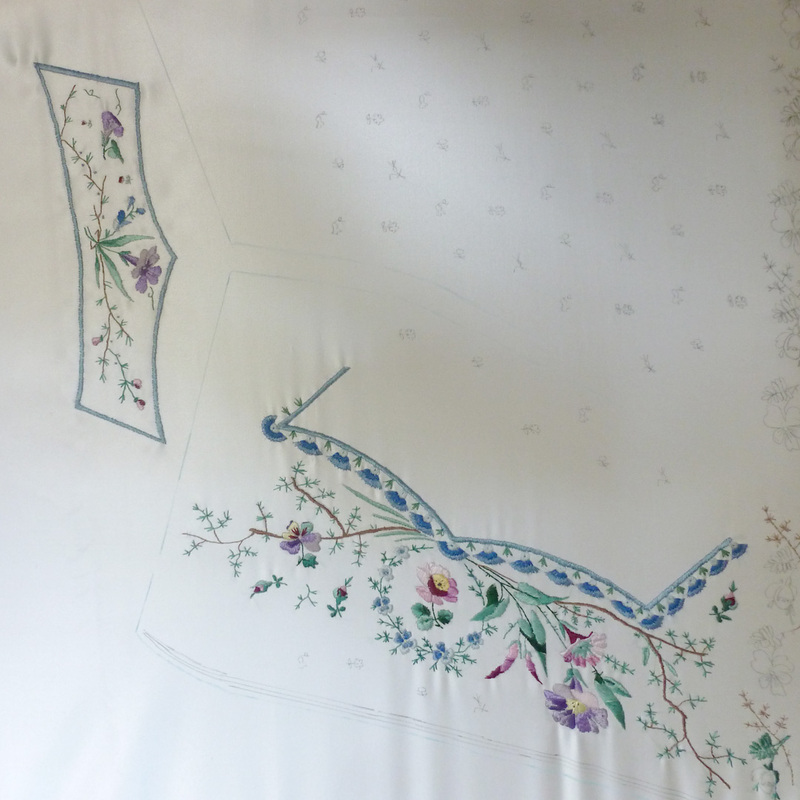 Now I went into the project with a similar mindset as I had with the quilted petticoat – I am not doing this again, so I better to the best waistcoat I can make. 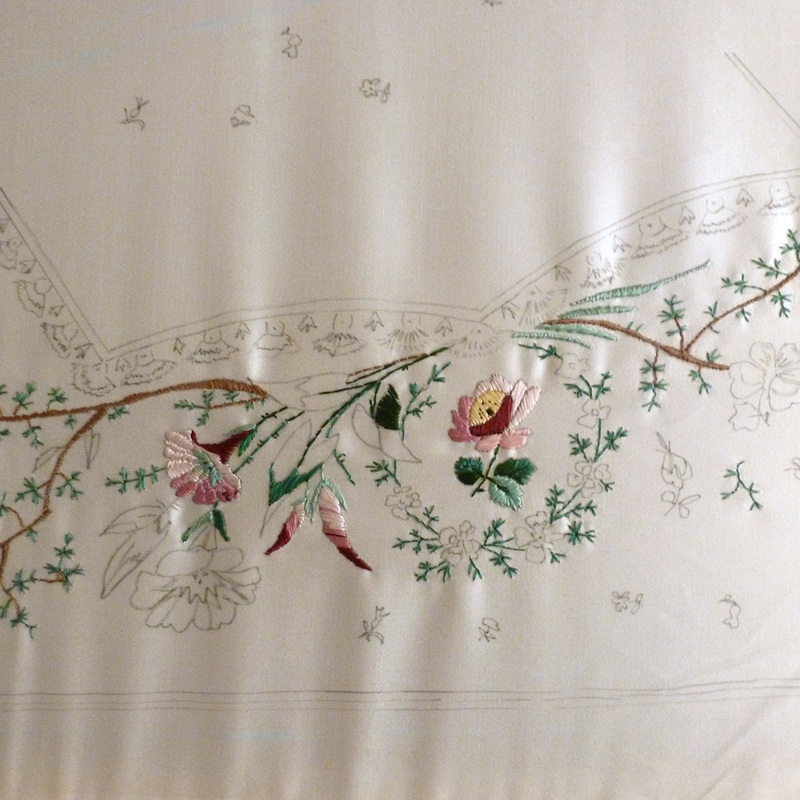 I splurged on expensive silk satin, proper silk embroidery floss and a proper large embroidery frame. And I didn’t go for an easy embroidery pattern, but one I really liked. 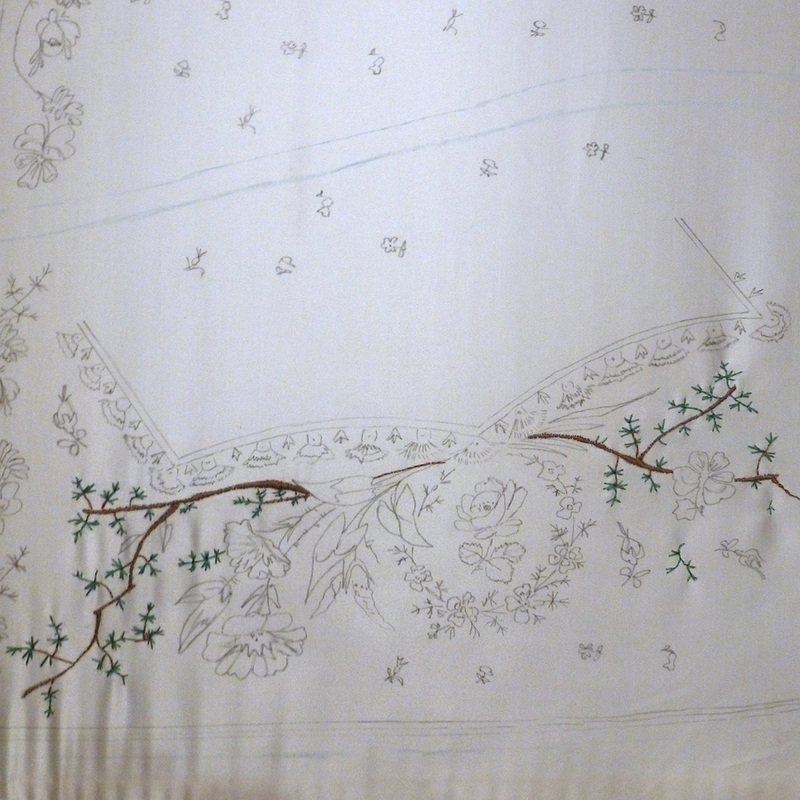 My embroidery pattern came from the V&A. 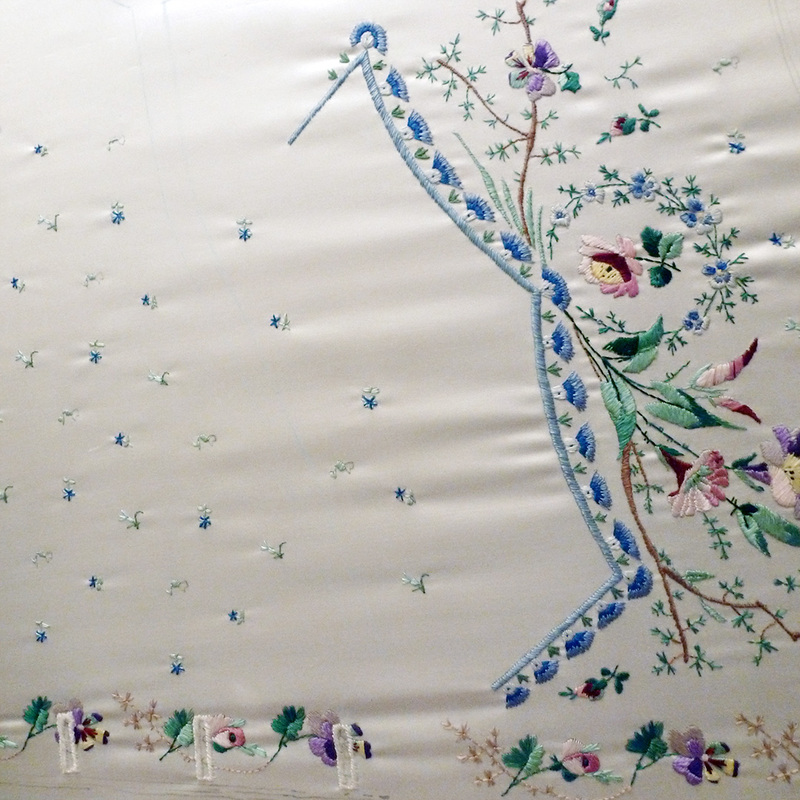 They have a collection of 1780s watercolors that are embroidery designs for waistcoats. They were made by Jean Pillement and Charles-German de Saint-Aubin. 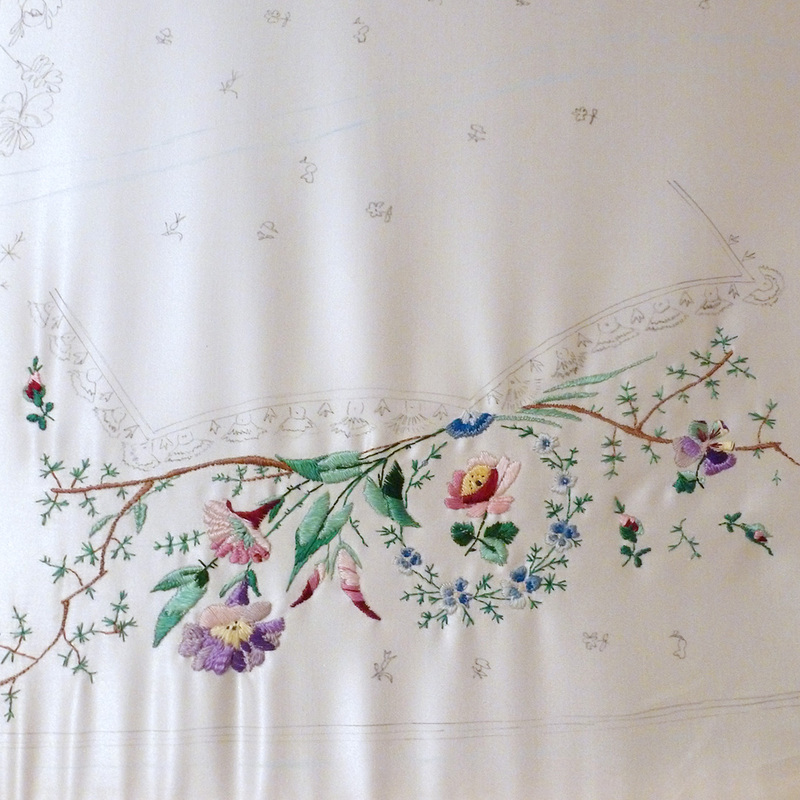 The advantage of using these was that I am not competiting with an extant garment but am still pretty close to using a historically correct design. The design I liked best had no pocket flap, so I I just stole a pocket flap from a similar design. 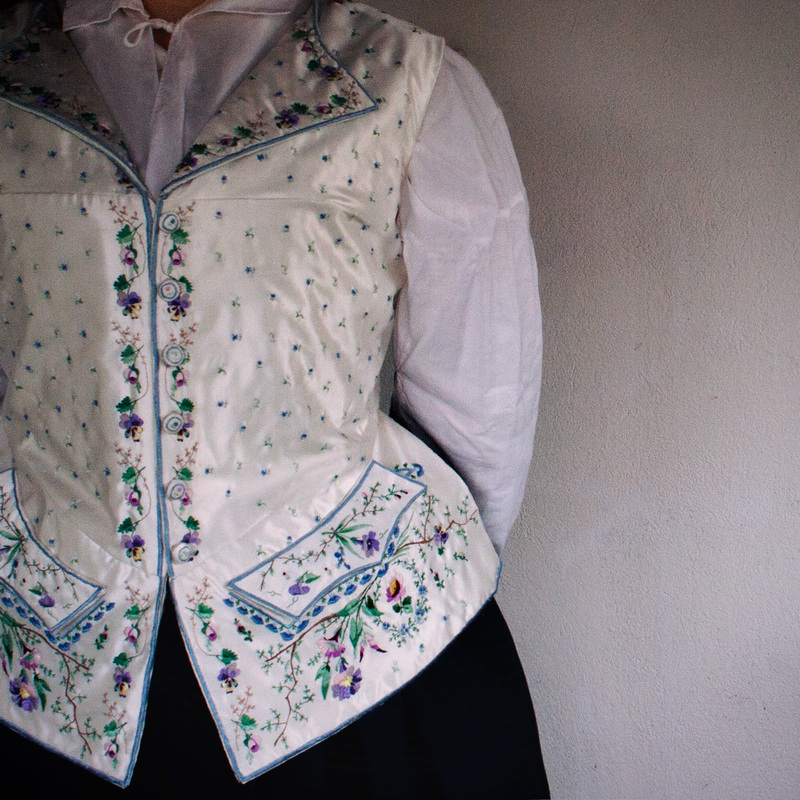 I also took the small flower pattern that is all over the waistcoat from a third design but altered it so heavily that you cannot really tell its origin. I also had to adjust the design of the hip flap since its front edge was not meeting in the middle like my waistcoat pattern would need to. I filled the remains out by replicating a few elements from the other side of the flap. Also the design is not in the best condition so I had to guess a few times what to draw in. After that, I started to embroider and that’s really the long and short of it. 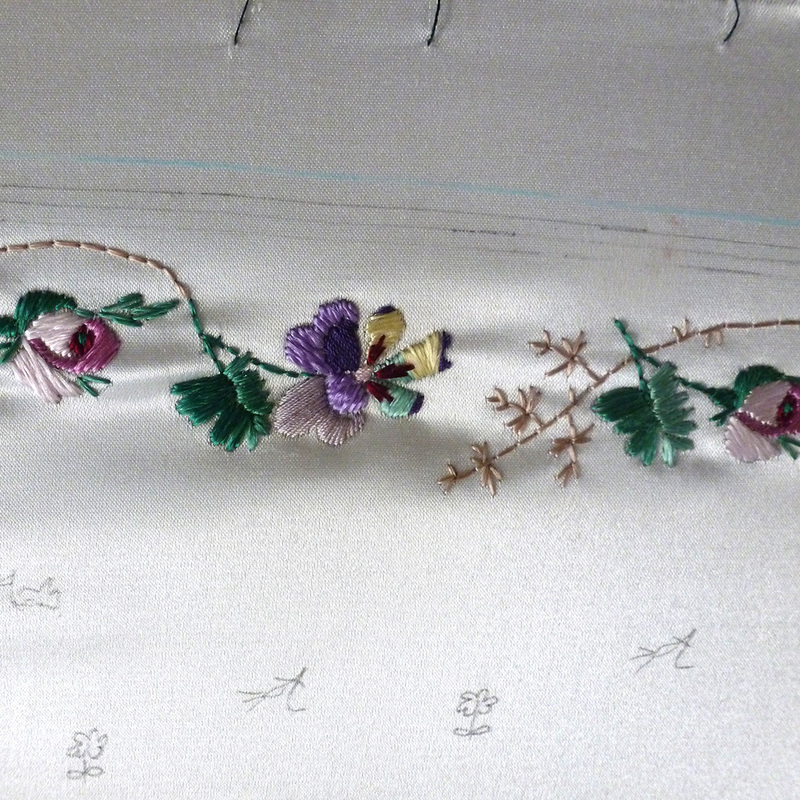 I am not quite sure how much time I spend embroidering, I wager it’s between 100 and 120 hours. In this time I managed to watch the entirety of Stranger Things four times which sounds weird but actually not needing to watch while watching television is really helpful. Embroidery is also repetitive and not intellectually challenging but unlike quilting your eyes need to be on the embroidery all the time. It was surprising that what took most time was the all over pattern. It looks like nothing but it contains five different colors and I didn’t connect threads between the flowers. So I made a little knot on my thread, embroidered, made a small knot at the end of the embroidery, cut it off and then rinse and repeat for 200 duotoned/tricolored flowers. That took time and was incredibly annoying. I completely underestimated that part. I also underestimated that doing the border would be intense. Just doing the border of one pocket flap took 1.5 hours. Being too pedantic with color was a bit of an issue since I didn’t calculate the final effect. I rejected a light blue because it had a slight green tinge and used it more sparingly elsewhere. On the final garment I cannot tell the green-tinged blue and the other blue apart. On the roll some colors look fairly garish and intense. When there is only half a square inch of it in the middle of white satin, it loses some of that intensity. All in all, I used 26 different colors. 6 greens, 2 browns, 2 yellows, 1 black, 1 white, 5 blues, 5 pinks, 6 purples. The color I used most was the light blue for the border. Each number/letter corresponded to a unique color. After finishing the embroidery I let the embroidery hang out for two days, hoping it would stretch out all creases. It did. 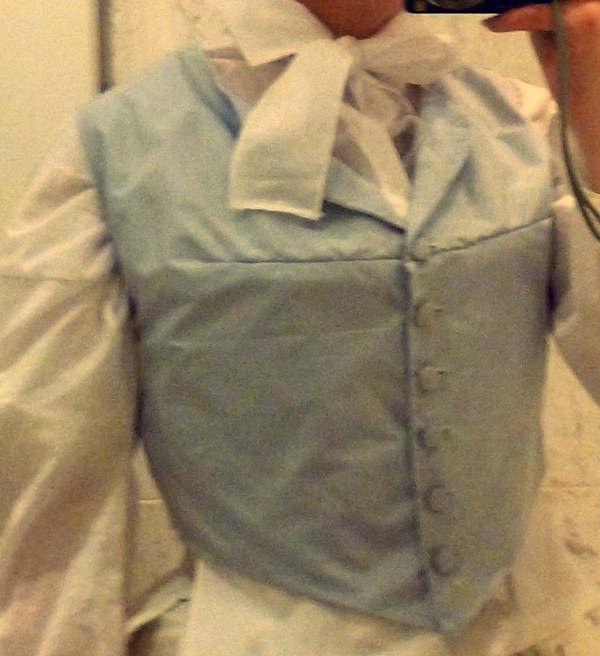 Then I cut it apart and started on the “Tailoring for dummies” part of making this waistcoat. I had researched this a bit and it was obvious that the material needed interfacing for stability. 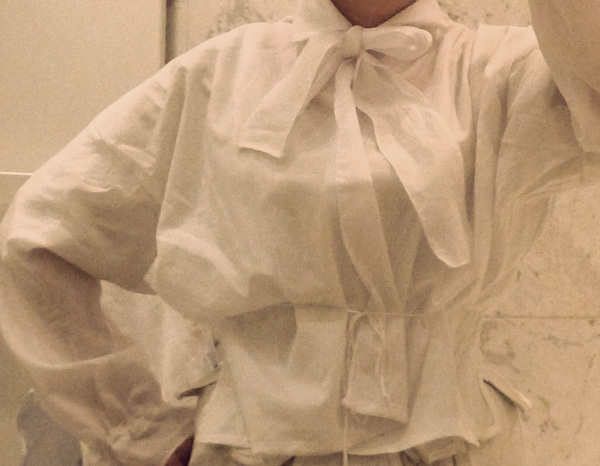 I decided to err on the stability side: the pocket flaps were underlined with a layer of cotton coutil, then two layers of stiff linen canvas interfacing and were lined with white silk taffeta. 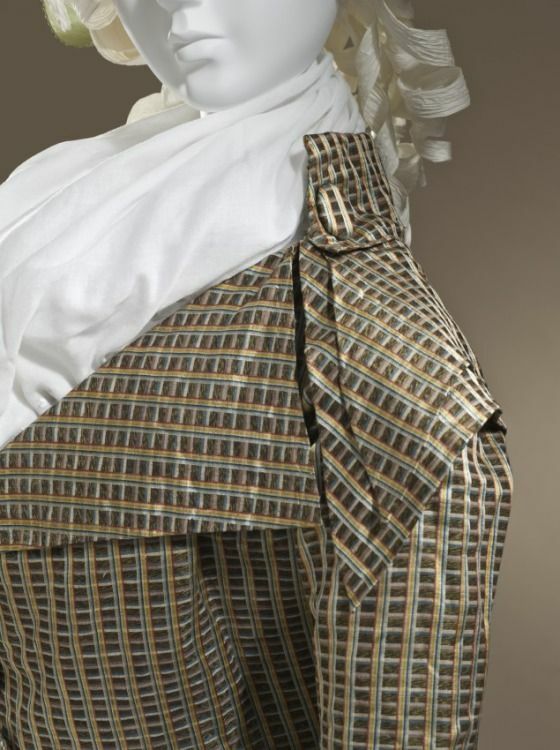 The waistcoat itself was underlined with a firm cotton duck, the hip flaps and front were interfaced with one layer of the stiff linen canvas. 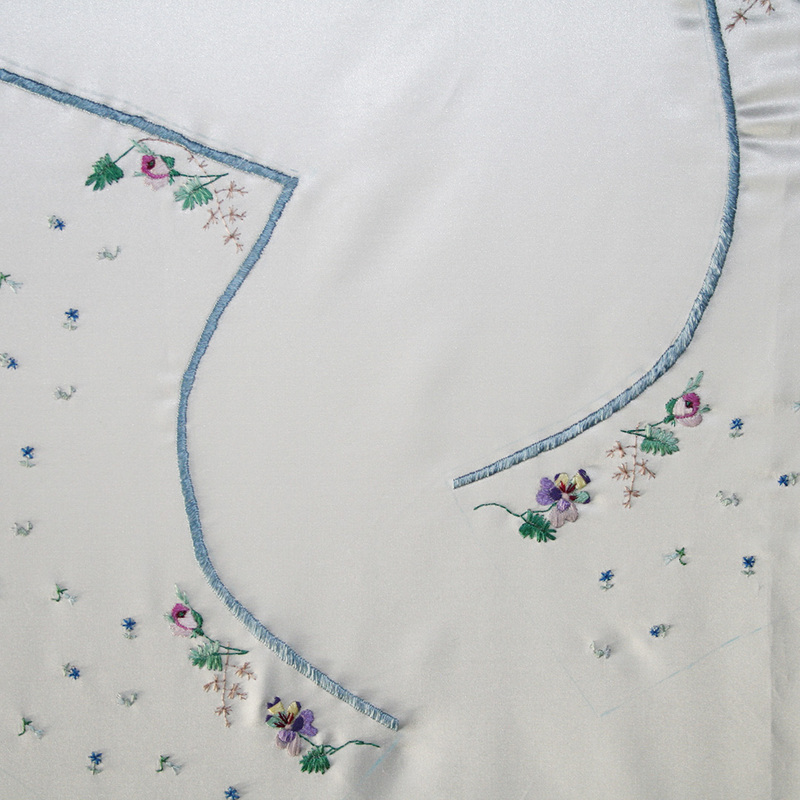 The lapels were interlined and padstitched to one layer of cotton coutil. 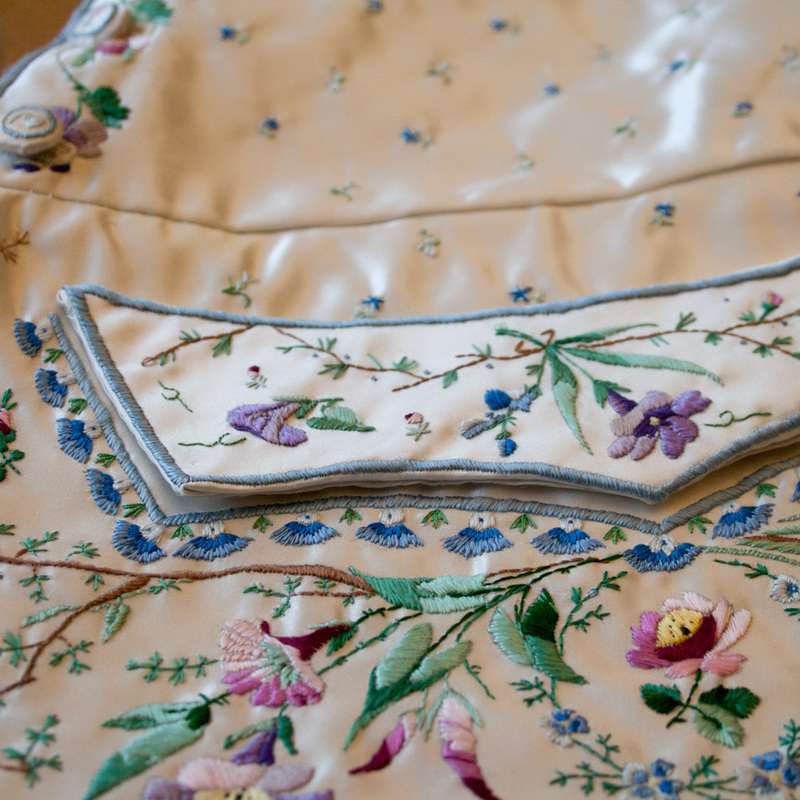 The whole waistcoat was backed with a vintage/antique fine linen chintz. Then I made the buttonholes, the buttons and a plain linen back that laces up for adjustment. Just making the buttons took three hours. That was the point where I grew very tired of this project. 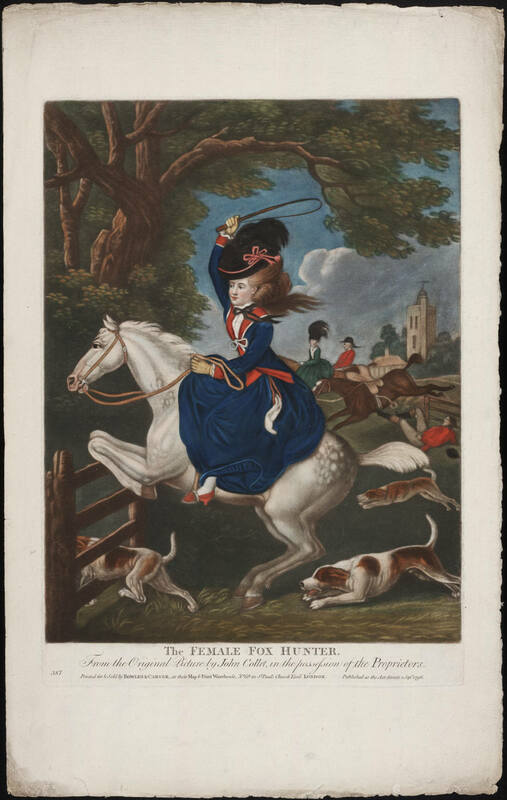 Now I only needed a matching 1780s riding habit…. I don’t own a hatstand, so what you see is actually my… kitchen towel holder. It could be worse. 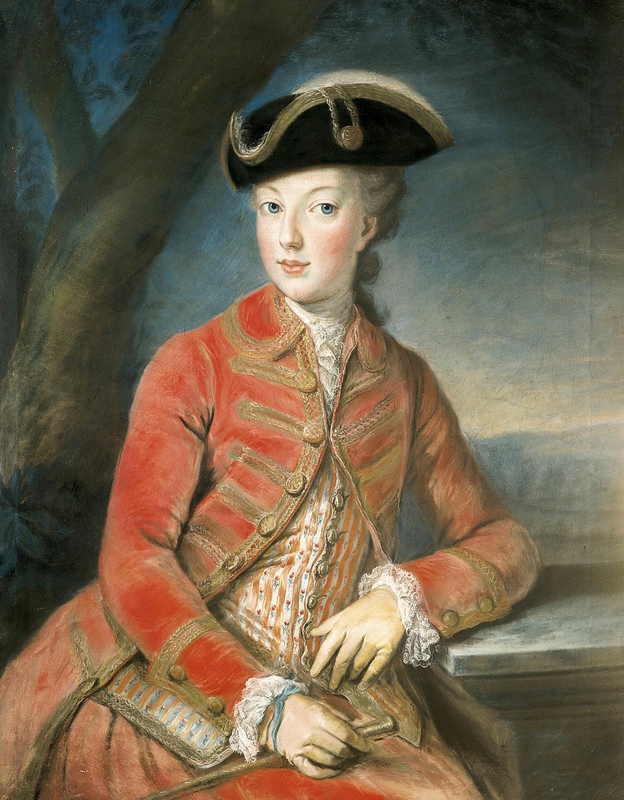 I actually needed a new 1780s hat for my new 1780s riding habit (as much as you need any 1780s hat anyway) and from observing the fashionable imagery of the 1780s, it became quite clear that I needed a hat with a high crown and wide brim rather than decorating my fifth bergere hat. To be fair, I only finished the embroidery in 2017. The waistcoat itself took a bit longer. 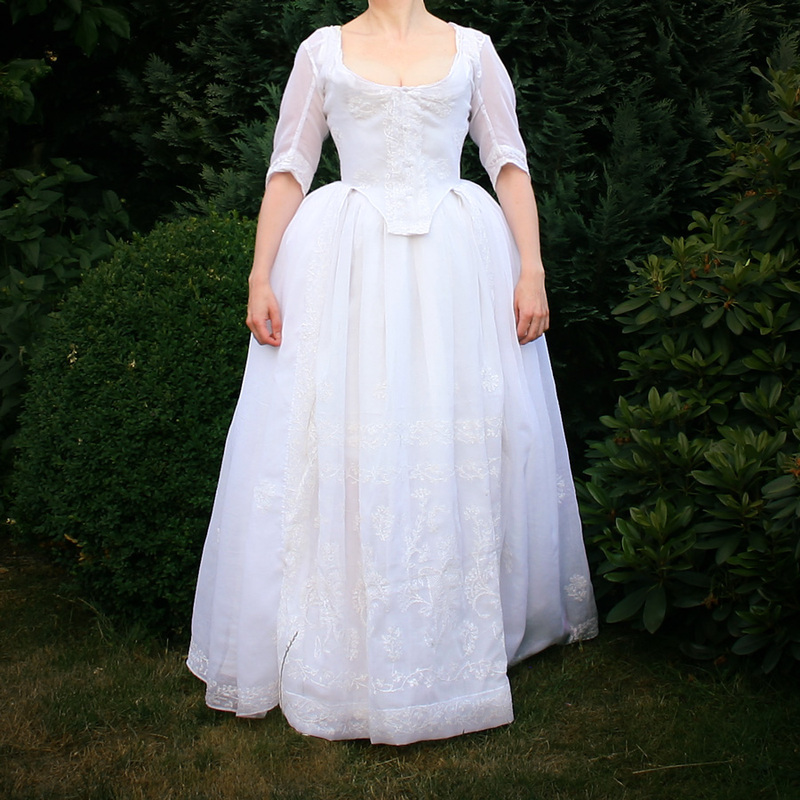 I finished the court gown. And yes, I ended up adding a small train.I was out of my original fabric (which I knew from the very beginning) so I just used a gold-colored silk taffeta. I kept it short so it could be actually worn in public without causing accidents, leaving it to drag on the ground a little (it was lined) but not by much. 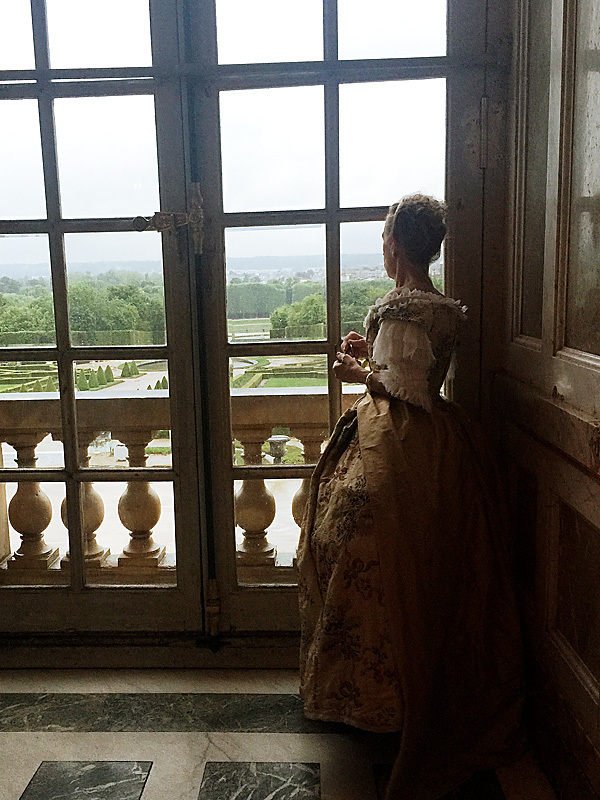 So in the end, it did end up being a grand habit de cour. That description alone made this gown such an ambitious project. It intimidated me and it still does. But it also challenged me. 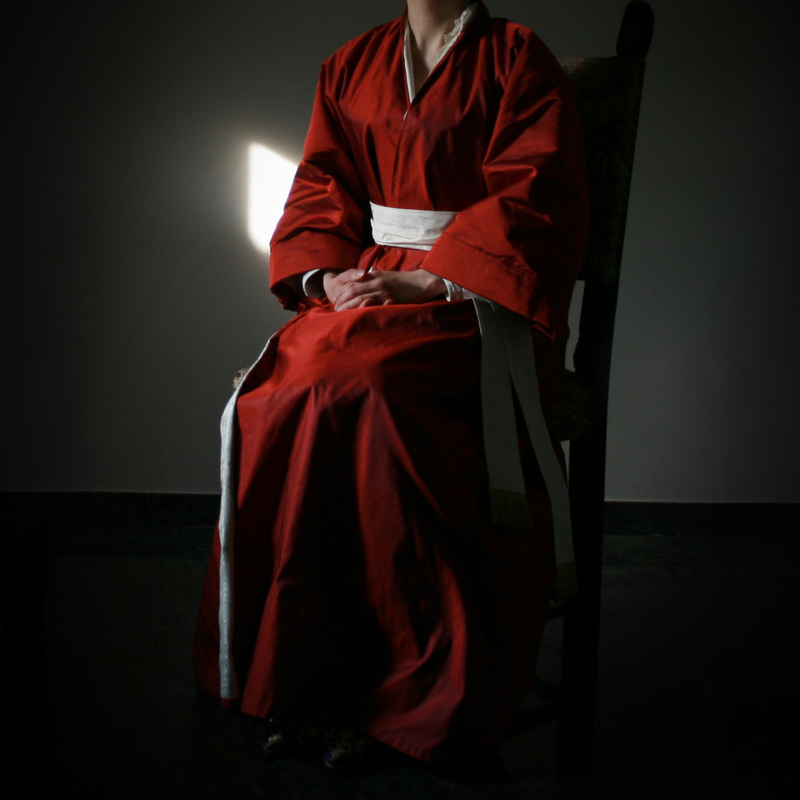 I am doing a court gown out of lampas silk for the same reason – if I spend so much time on a project… why not go all out? Unfortunately was the best front view photo the one with the dumbest facial expression. So how was it made…. 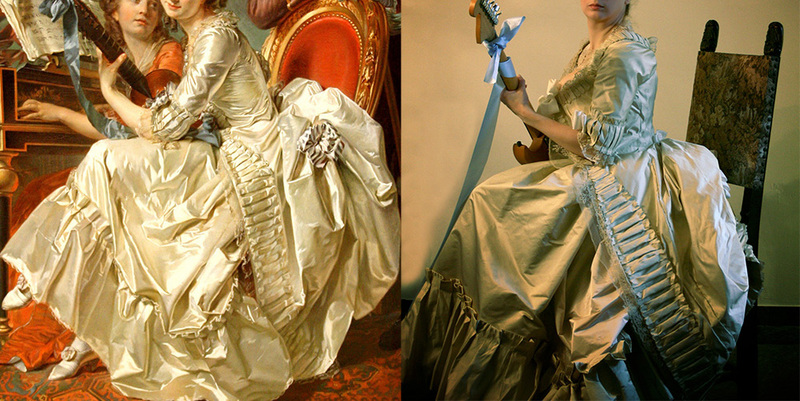 Last year around this time I fell in love with a dress from a painting by Louis Rolland Trinquesse. 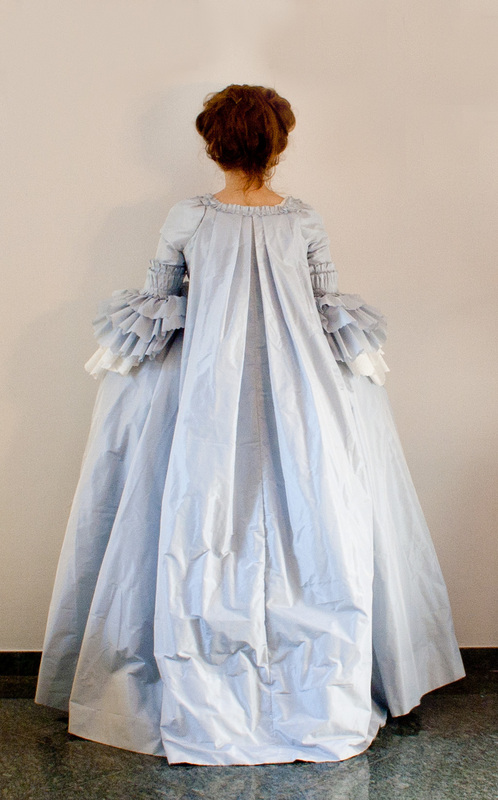 Since I’ve never done a proper Robe à la Polonaise, I decided to try and make this one. 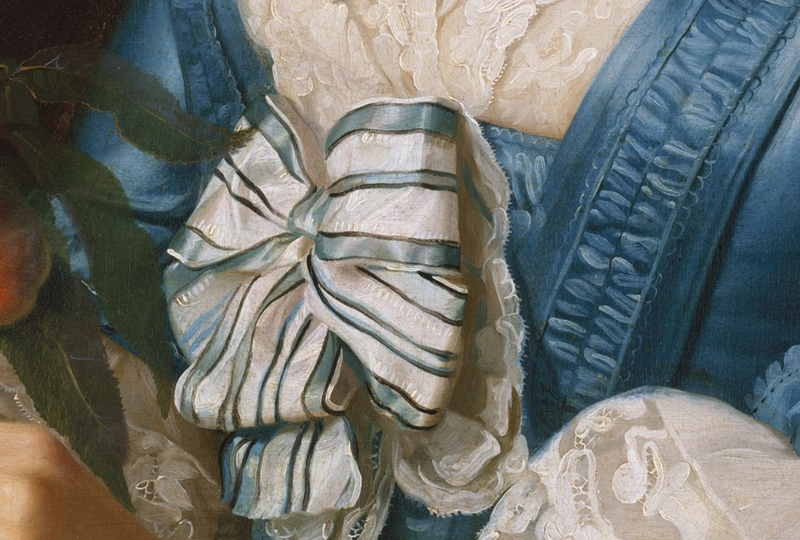 Lace bows were pretty popular in the 18th century. And as it happen my current projects requires one of these multi-layered bows that resemble a flower more than the resemble a traditional bow. Okay, fun fact: I have done a lot of stuff recently that I didn’t document making all that well. 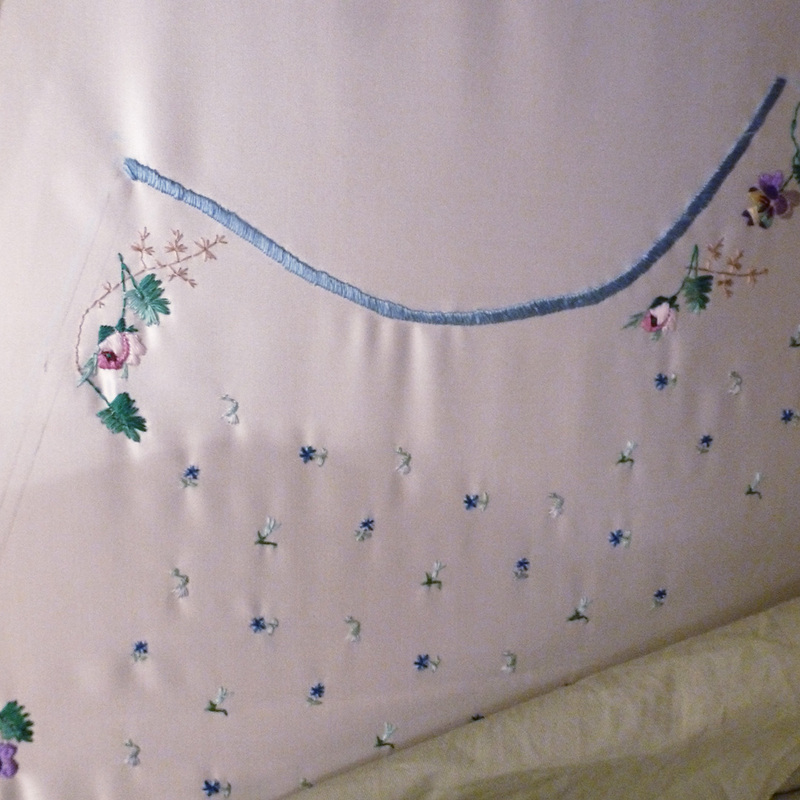 I made this with an Ikea Ljusöga pillowcase based on the Swallowtail Jacket at Colonial Williamsburg, using the pattern from Costume Close-Up. It was supposed to be a quick and dirty project. Which became kind of funny when I realized that I had made this one for +6′ tall person and had to alter everything to fit my smaller frame. One key element was that I wanted the lacing in the front and I wanted that lacing to be functional. But I didn’t wanted the functional lacing to go through the fashion fabric. So I put the lacing holes into an extra linen strip directly under the open sides of the front. That means though that I have to pin the fashion fabric to the strip after lacing, otherwise the lacing holes would show because the fashion fabric layer just doesn’t lay flat. Also I had a few lacing holes too many, which in addition to the pinning made this “practical” garment a total pain to lace myself into. 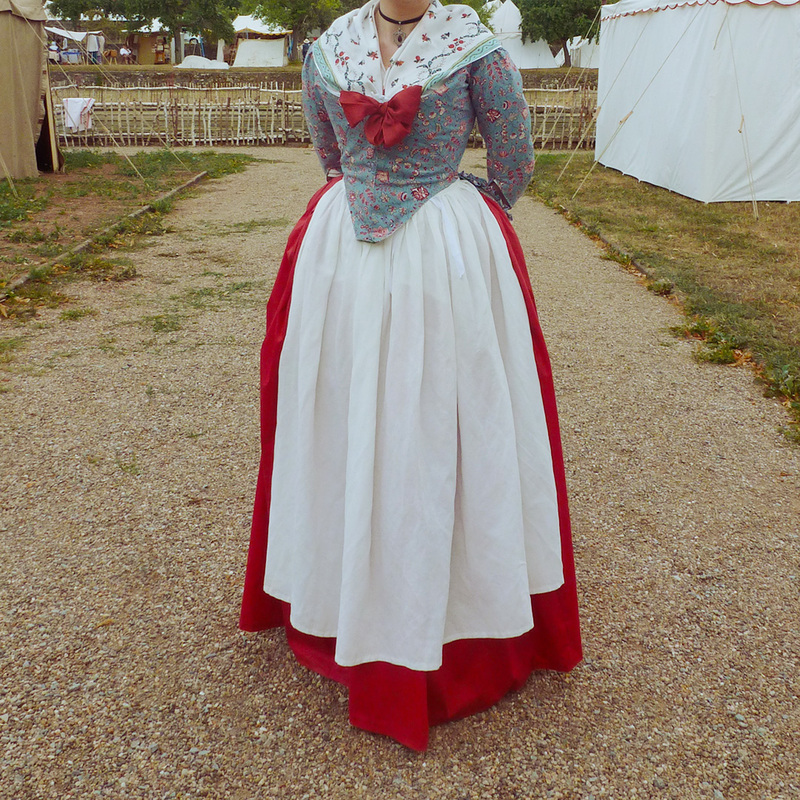 I also made a red petticoat that was supposed to allow some rough handling. It did handle mud okay. But it doesn’t dry very quickly which is not good. I basically went for the first worsted wool fabric that looked okay-ish and that was a mistake. I ended up with a really heavy fabric whose feel I didn’t like. So when I messed up the pattern and ended up missing about 4 inches at my waist, I made the choice (wrong one, obviously) to not undo that and add another fabric piece at the side sesams but rather leaving it open, only held together in the middle of the chest area. (I wanted to be done with that jacket. (Again: mistake.) 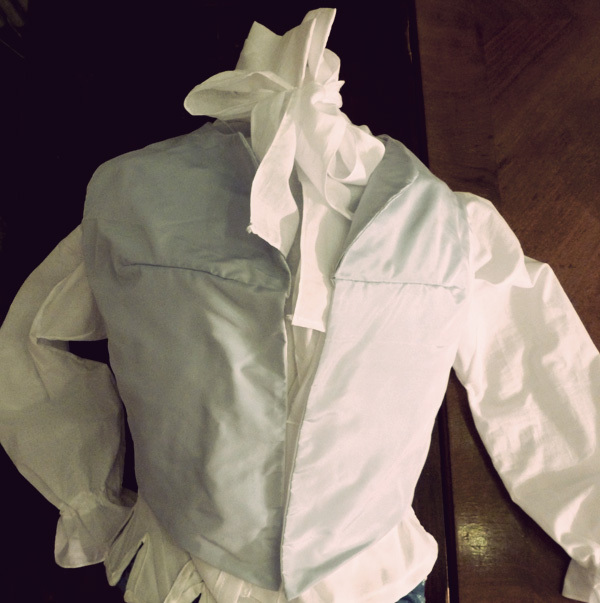 This meant that I had to make a vest and shirt for sure (instead of cheating), line the jacket’s lapels in light blue silk and alter it further and further. This is actually the best picture! Ironically I was actually assured that this worsted wool fabric will last forever. The worsted news. 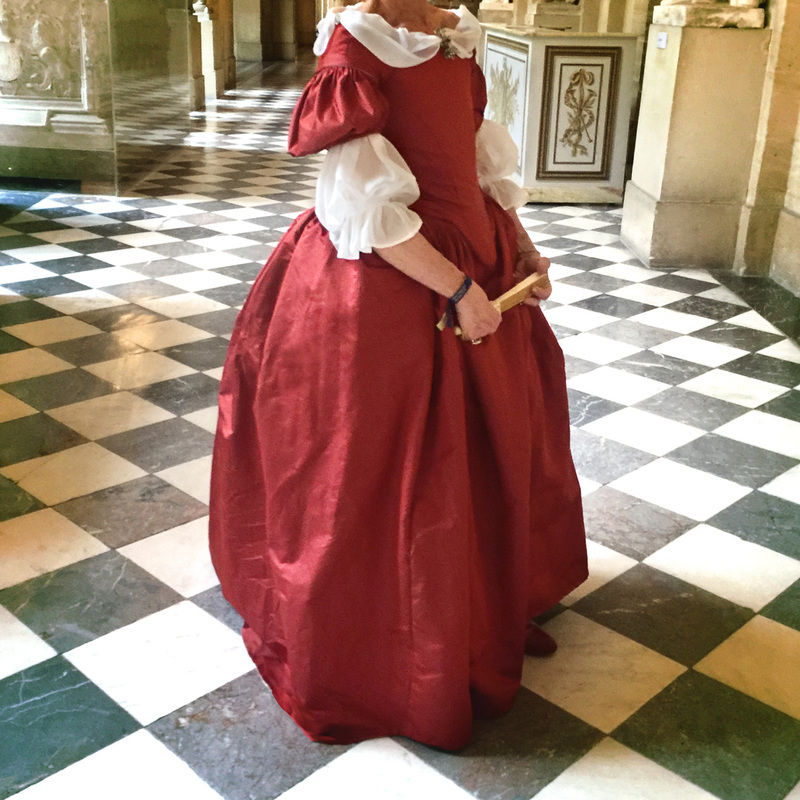 I also made a Robe à l’Anglaise out of handprinted Indian cotton (which used plant-based dyes) which is so historically correct that I felt I should have worn a sign that said as much along with it. The funny thing about this dress was finished so quickly that I failed to document much of the process. I added the elbow sleeve thingies because I made the sleeves a bit too short. Unfortunately I was so out of fabric that it was all pieced. 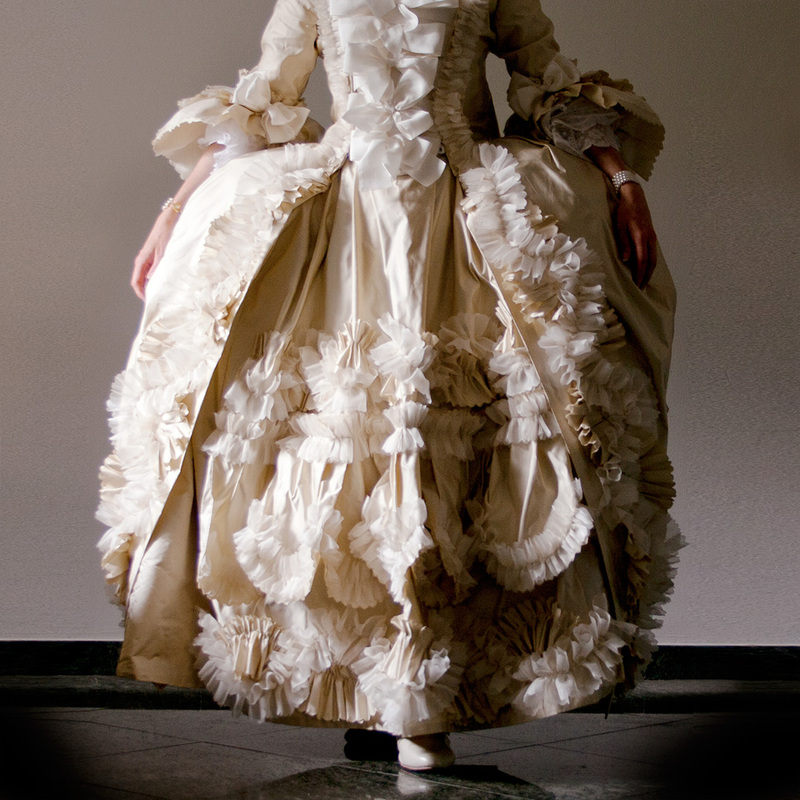 (That’s why the petticoat is a cheat petticoat that only used the fabric where it showed.) To cover up the pieced-ness of the elbow things I added a bit of ruffle which was even more pieced. 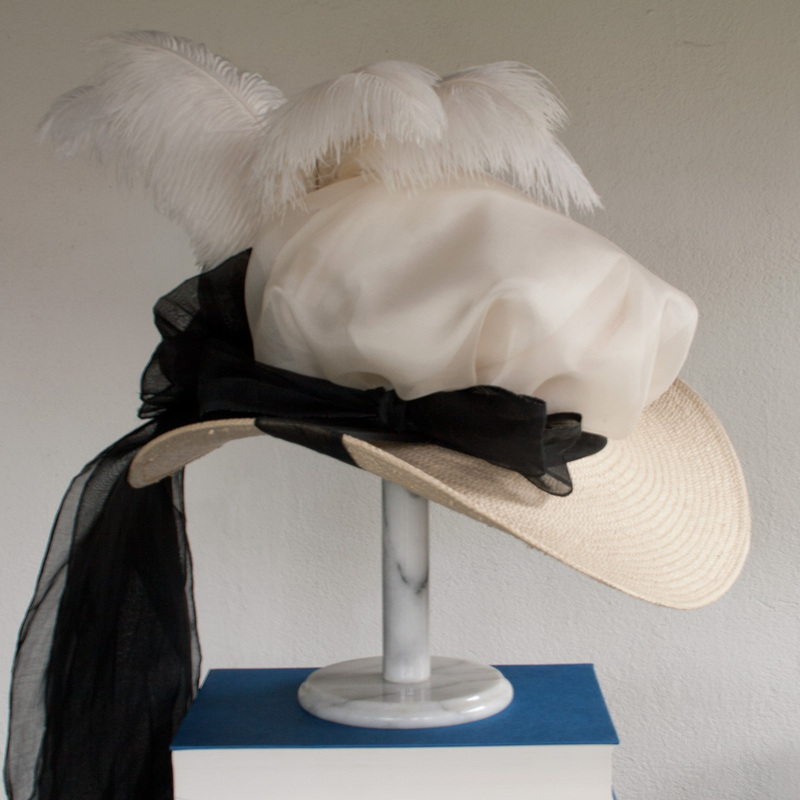 I started looking at a lot of caps and my favorite was the combination of silk lampas and gold lace. 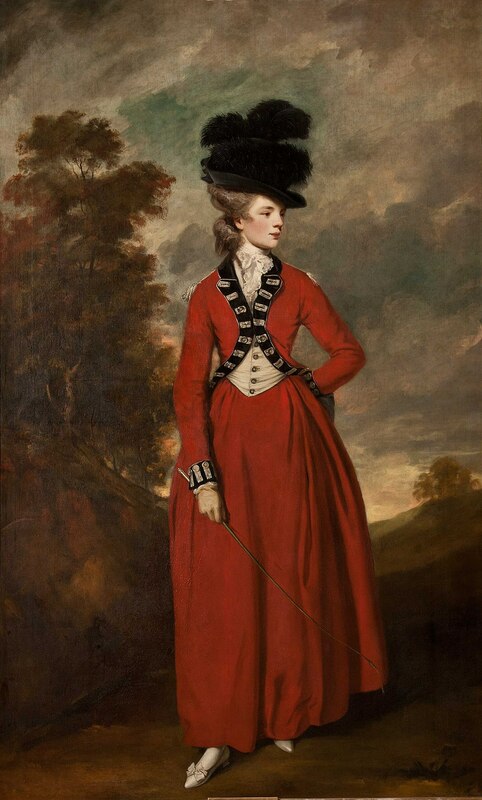 I have found none of these in aristocratic portraits of adult women, so this cap is fabulously unsuited to go with, like, 95 percent of my 18th century wardrobe. But the heart wants what it wants, right? This was a major inspiration. As were a few extent caps. The pattern was an alteration of a Duran Textiles cap pattern that I further altered on the cap itself after the one corner looked way too harsh. I traced this off my computer screen because my printer is out of commission. Making sure some of the brocaded flowers made it onto the cap. The was the moment I realized that the corner edge didn’t look so swell. Then I applied the vintage gold lace by sewing both the inner and outer edge of the lace to the cap.